I came across a video on YouTube that shows an example of KOReader running on the Kobo Aura One. It’s the first video I’ve ever seen that actually shows KOReader, an alternative open-source reading app, on a Kobo ereader. I tried installing it on a Kobo Touch once but it wouldn’t work so I didn’t try it on the Aura One, but now I think I’m going to have to give in another shot. The video doesn’t show all the KOReader features, but it shows enough to be intriguing, especially some of the menu options. 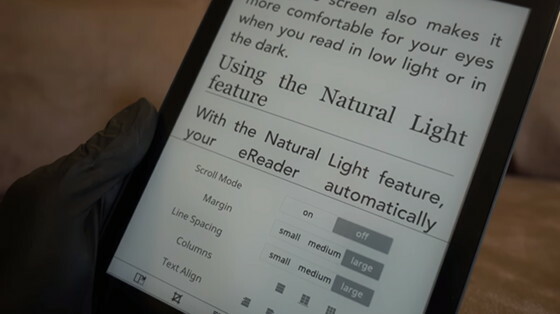 The video is comparing the default PDF app with the reflow capabilities of KOReader on a Kobo Aura One. The KOReader part of the video starts at the 3:50 mark (the video below is set to play from there). As mentioned in my Kobo Aura One PDF review, the default PDF features are severely lacking. I don’t think Kobo has made a single improvement to the PDF functionality of their devices in over 5 years. Because of that, I find a 6-inch Kindle a much better option for PDFs than the 7.8-inch Aura One. But with KOReader installed it might be a different story. After I get some other reviews wrapped up I’m going to have to try KOReader on the Aura One and see how it stacks up. If you want to try KOReader on your Kobo, there’s this install guide at MobileRead, and here’s the official KOReader page at GitHub. It works with other Kobo ereaders too, not just the Aura One. Interesting! Looks very promising. Open source alternatives are very welcome. I hope Kobo doesn’t block the possibility of installing custom firmways like Amazon did on the Kindle. I bought an Aura One because I knew I could install KOReader on it. It allows me to read two column PDFs easily, or use the reflow mode while trimming the margins and increasing font size and weight. All these is done by the reader on the fly, and tapping on the upper left corner of the screen allows to switch between this “tweaked” mode and the original one (useful for “reflowed” graphics, for instance). Although I don’t usually do it, scrolling works fine even after having applied all these modifications. And you can choose between portrait and landscape mode, too. So yeah, I’m a happy KOReader user :-). And once installed, you can update it from within KOReader itself via wifi. Been saying that, here, for years, I believe. Frankly, tablets are much better than e-readers for PDF’s but, if you have to read PDF’s on EITHER a Kobo or a Kindle (and, after once blocking it, Amazon now allows such), KoReader is the way to go. I don’t think it’s worth it in your case. The installation is definitely outside of your comfort zone, and (at least to me) most of the advantages of KOReader come from its vastly superior PDF abilities. The only thing I can think of that could be interesting is being able to use the reader in landscape mode. I adore my Kobo Aura One. I rarely use it for reading pdfs, but I daily read epubs and kepubs. My only disappointment with the Kobo epub/kepub software is that I find it extremely difficult to highlight or add notes. When highlighting, the highlighted portion often disappears before I have a chance to tap the “highlight” button and sometimes disappears even after I tapped the “highlight” button. Also, accuracy in highlighting is almost impossible (that is, highlighting precisely the words that I want to highlight and leaving the other words alone). I love to make highlights and take notes in my books, so this limitation has been really frustrating for me. I’m wondering if the KOReader software has any epub features that would fix this issue? I would love to hear your thoughts. Is the software up to date? Highlighting works way better for me with the latest software. I’ve never used KOReader so I don’t know how it compares in that regard. No, it’s still running software version 4.2.8283. I’ve been keeping the wifi off to deliberately avoid an update, because I don’t like the look of the new home screen. But if the highlighting function is significantly improved, I would sacrifice the home screen to get it. Which software version do you have, Nathan? Thank you for your help! Mine is running 4.4.9349. Highlighting still isn’t great but it’s definitely a lot better than it used to be. I wish they had an option to go back to the old homescreen, though. I don’t like the new one either. It’s annoying that it doesn’t show recently added or downloaded books. You have to go hunting to find everything. After a great deal of trial and error (mostly error), I have finally have a working installation of KOReader. My preliminary test with a pdf format of a magazine is that it is working very well. I can read even 3 column pages with little trouble. The text is small, but readable. David, please could you tell me how you instaled KOreader… I have been trying a lot following the sugested guide but noting works. I need to read pdfs with formulae then y need koreader a lot! Hello Nathan, is koreader also interesting for reading epubs? Yeah, it supports a number of formats but I don’t know how it differs from the stock software since I haven’t had a chance to try it yet. ok, I will try it out during my holiday, I’m curious!